Our back support aids are a type of posture cushion support for sitting. This include posture cushions for car seats and chairs and orthopedic office chairs. 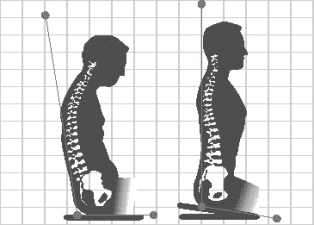 Good ergonomic sitting posture raises your hips gently and naturally so that they are slightly above your knees. Most car seats, chairs, and other places you sit don’t raise your hips enough. This puts your hips below your knees, which is too low. This position forces your pelvis to tip back and your spine to bend forward. As a result you feel fatigued, achy, or in pain all because of the stress this lower seat puts on the rest of your body. To get back support for a car seat; the best way to be ergonomic is to sit on a wedge shaped seat support. We have also designed a line of orthopedic office chairs for bad backs. Our Pure Posture Chair and our wedge shaped Sit EZ Orthopedic Seat Support offer better seat support by gently raising your hips above your knees. This takes the stress off of the rest of the spine thus relieving back pain and neck pain caused by car seats and chairs. Our Pure Posture Chair offers you the right sitting angle in an office chair. This is the best chair for back pain. It works great for general desk work, as a computer chair, and as an all around office chair. Our Sit EZ Orthopedic Seat Support provides the best back support for a car seat. You can use it at your desk, in an airplane and in many other chairs. A Shim is available for fine tuning your comfort. Place it across the front or the back of the underside of the Sit EZ Orthopedic Sit Cushion. This enables you to adjust your Sit EZ based on how low you sit in back.